Denne weekend blev derfor dedikeret til slappe-weekend, så jeg startede weekenden med at købe nogle flotte roser, som jeg vidste, at jeg ville få rig mulighed for at gå hjemme og nyde hele weekenden. Det er alt for sjælden, at jeg forkæler mig selv med blomster, men derfor er det også ekstra lækkert, når jeg får det gjort. Derefter har den bare stået på råhygge og en masse syning. Hey, I just wanted to drop by and let you know that I'm still here. The last couple of weeks has been very busy for me. I have spent 10, 11 and even 12 hours at the office and at the same time I have been preparing for an exam. This blog was actually my exam project and I got a "B" so I'm very satisfied with that. Therefor this weekend has been dedicated to relax. I began the weekend by buying some flowers to decorate the livingroom for the weekend. I never buy flowers to myself therefor it is just extra nice when I finally do. Then the weekend could begin and I haven't done anything else that relax and lots of sewing. I've joined Julies "For my self! Month". 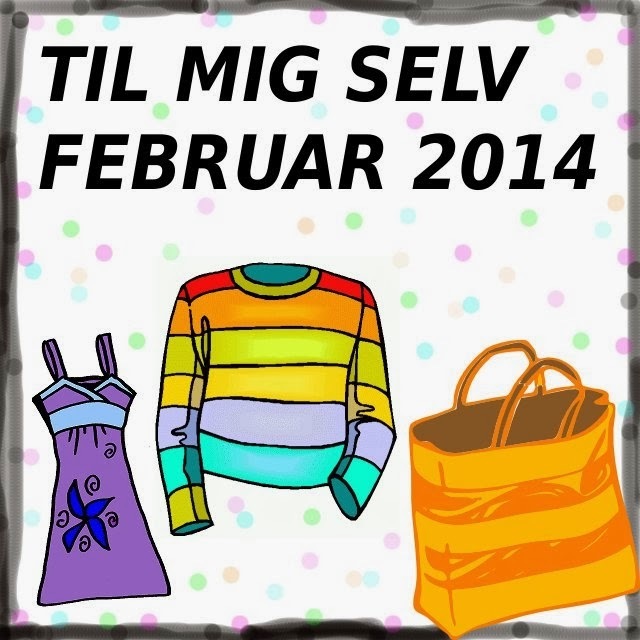 This Means that you should sew things for your self through the whole February month. I really look forward to start sewing things for my self, because this is something I do way too rarely and I have so many ideas in my head just waiting to be tried out... well so far I have bought fabric for 3-4 projects, so we'll see how much I'll get done.